The Poecilotheria regalis originates from India, hence its common name of “Indian Ornamental”, and it is probably the most commonly kept of the Poecilotheria genus of tarantulas. This is an arboreal species that, in its natural habitat, lives in tall trees where it catches flying insects as its prey. In captivity, they are a hearty and gorgeous display tarantula for any keeper experienced with fast arboreal species. 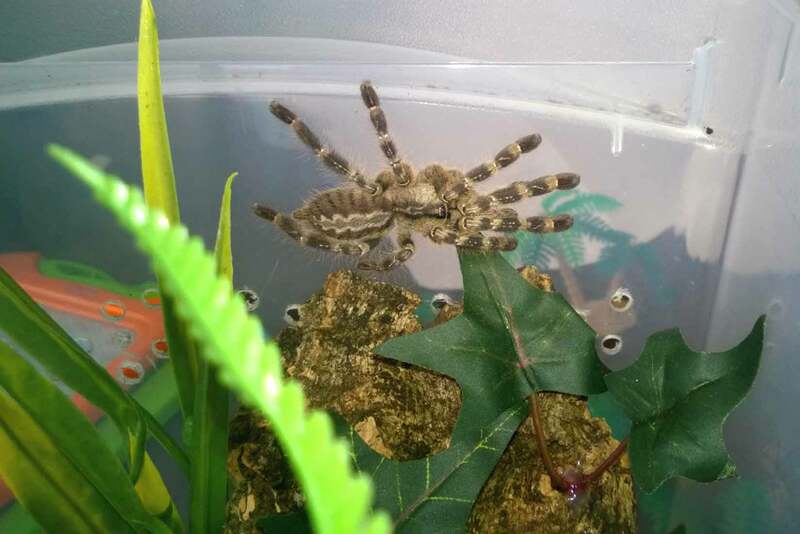 My 3″ juvenile P. regalis male. Although the regalis is recognized as being one of the “calmer” members of this genus, it is still blindingly fast and possesses “medically significant” venom. This is not an animal to be trifled with or underestimated. I have seen my juveniles run several laps around their enclosures in blink of an eye. This is definitely an animal that can move faster than human reflexes can react. In the case of the P. regalis, when disturbed it would much rather hide or escape than attack. Their fractile-like patterns serve as amazingly-effective camouflage, so standing still can likely help them to avoid detection in the wild. When approaching any of my Poecilotheria for feeding or maintenance , I tap the enclosures a couple times until I see them either hunker down or scramble to a hiding spot. This hopefully prevents me from spooking or surprising the Ts, which could cause them to bolt frantically around the cage (or, even worse, onto me). Keeping my guy comfy (while keeping my fingers safe). To reduce the risk of bite, I keep my P. regalis juvenile in a Sterilite Large Nesting Showoff plastic storage bin modified with cross-ventilation holes for airflow. The container is a bit larger than what I would normally use for a specimen this size, but I like to give myself plenty of room to work when feeding or performing maintenance on my large, fast arboreals. The enclosure is deep as well as long, as this species requires more height than floor space. I provide it with a cork bark slab, which is put at about a 45 degree angle, as well as some plastic plants and rocks for hiding places. A water bowl is also supplied. With a max diagonal leg span of 7″, the P. regalis is a good-sized T. This guy will likely end up in a 5-10 gallon-sized enclosure as an adult. Again, I will use something that gives me plenty of room to work for when it comes time for cleaning or maintenance. 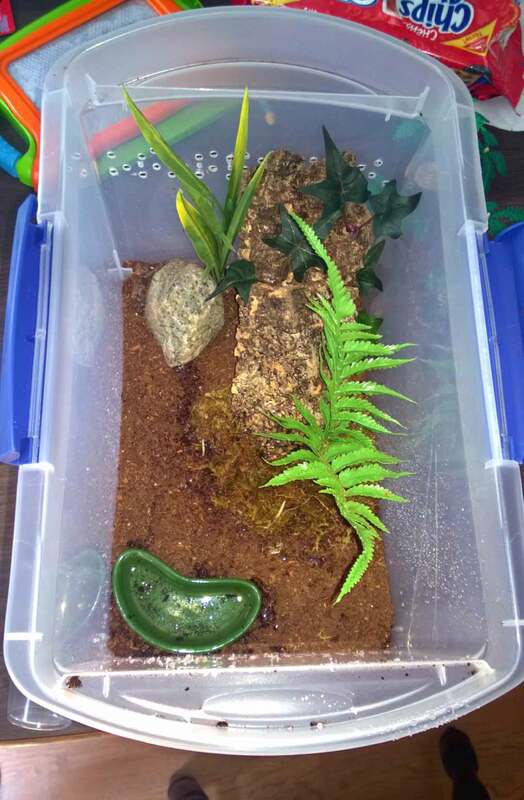 Custom enclosure set up for my 3″ P. regalis juvenile male. For substrate, my P. regalis is kept on a coco fiber/peat moss combination with moist sphagnum moss placed around the base of the cork bark to provide extra moisture. I also moisten the substrate a couple times a week; this coupled with the water dish keeps the humidity inside the enclosure at an sufficient level. I do not obsess over exact humidity levels, and so far my Ts have been doing just fine. This species does, however, benefit from higher humidity. For temperatures, my P. regalis is kept at low 70s to mid 80s. A fast-growing arboreal with a great feeding response. My P. regalis has demonstrated a fast growth rate. They are good eaters, and it’s quite amazing to watch them hunt a prey item. I give my 3″ juvenile two medium/large crickets a week. This species seems to have little trouble taking down larger prey items. I procured this particular tarantula in February, and at that time it was about 2″ long. It has molted twice since then, and it’s now 3.25″ long. I also have smaller P. regalis that I purchased as a 1.25″ sling in January. After three molts, it is now 2.5″. 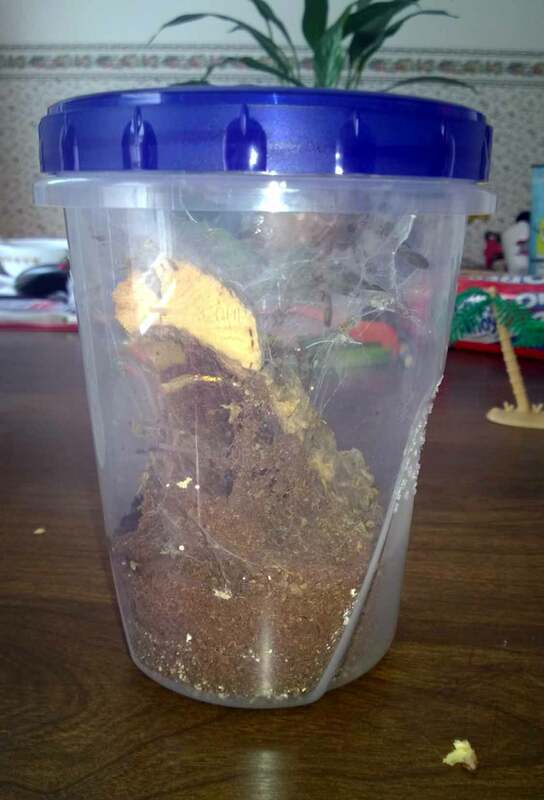 This is the modified Ziploc plastic container I use to house my 2.5″ P. regalis juvenile. He will likely get rehoused after his next molt. With its beautiful coloration and patterns, impressive size, and slender and athletic build, the P. regalis makes a stunning addition to any tarantula collection. As they are very prevalent in the hobby, the slings are quite inexpensive, running anywhere from $20 to $30, and a juvenile female can usually be purchased for under $100. That being said, this is a large, fast tarantula with very potent venom and not generally a species recommended for inexperienced keepers. For more information on this wonderful species, visit arachnoboards and search key words P. regalis!